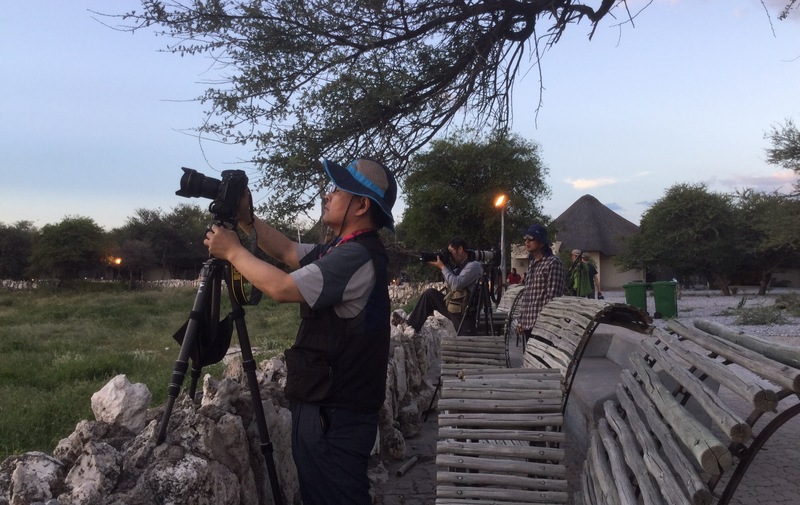 Trying to put Etosha Park into words is going to be work. We’ve just spent three nights here, pressing on now toward Botswana. 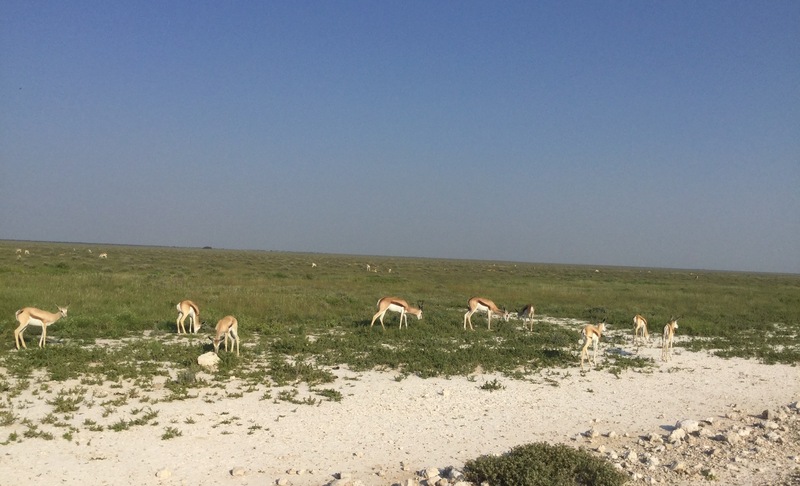 Etosha is all about the animals, animals without fences. 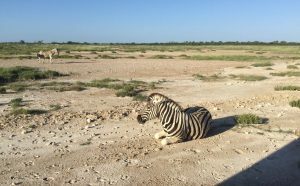 There are fences in Etosha, around the camps and around the odd Picnic spot, but they are for the people, not the animals. 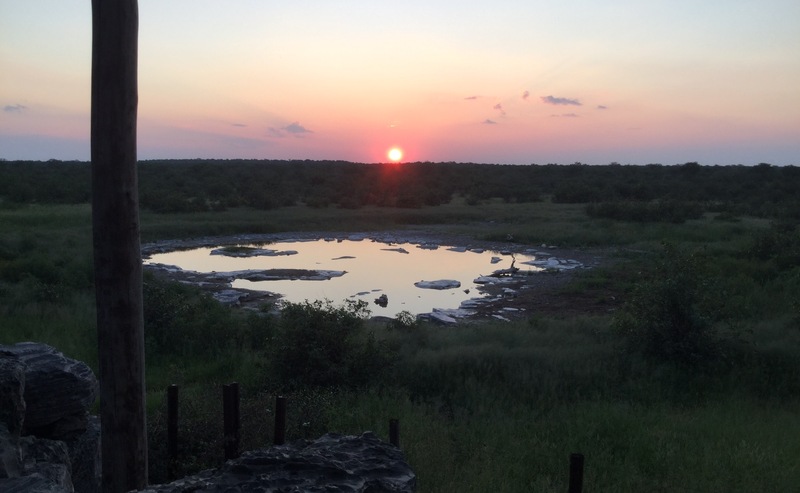 The Park has been created around the Etosha Pan, an ancient deep lake that is now mostly dry. The geography of the area just seems to be perfect for attracting the best of Africa’s wildlife. 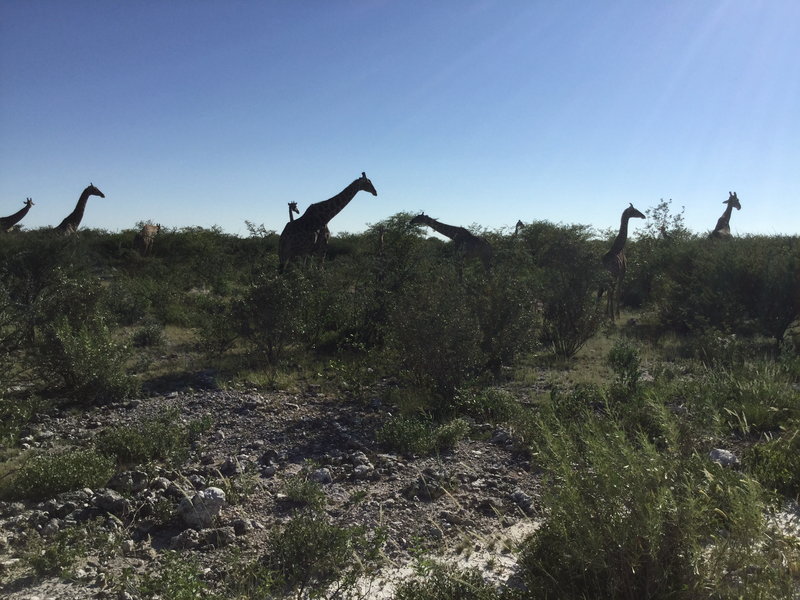 If you go to Etosha in the dry season, all you need to do to see amazing numbers and varied species of animals is hang about a watering hole, and everything comes to you. We are here during the wet season, an unusually wet one at that. For us the watering holes were amazing for bird life, but not much else. We had to go looking. 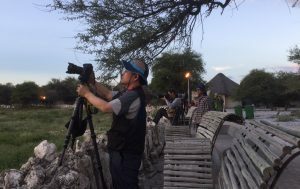 The Etosha experience goes something like this. Wake up early and pack up. 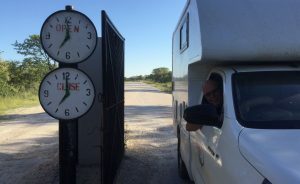 The gates to the camps open at sunrise, and close again at sunset. No driving is allowed in the park outside of these hours, for the protection of the animals. We were here at equinox, so 7 to 7 were our hours, exactly one day. We usually got on the road by 8. Our days in Etosha were spent driving, slowly, from one campground to the next. There were tons of people like us, self-drivers and safari trucks for those on tour. You see something you want to gawk at, and you just stop anywhere. There are watering holes throughout the park. Just don’t ever leave your vehicle. Only head and shoulders are allowed out. Have to pee? Forget it. Ray and I would find a gated picnic spot around mid morning and stop for breakfast, and then continue on until late afternoon. We started at the first western-most camp, moved to the middle and finally ended near the eastern gate. Each camp is slightly different but with similar services; at least one pool, restaurant and a watering hole. We would set camp and head off for a swim for a couple of hours. 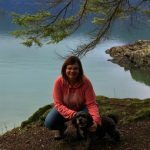 I made dinner each night and then we’d pack up a bottle of wine and two glasses and head off to the watering hole. We’d watch the sunset, and once dark the lights would come on. 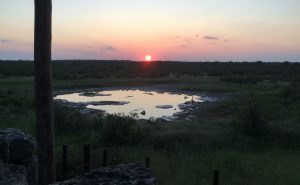 Because of the season we had no real luck with mammals, but the birds were amazing and the zen of the water hole was fantastic. One day we got caught up in a mixed herd of zebra and giraffes, babies and all. They surrounded our truck. It was tough to keep to the head and shoulders rule. 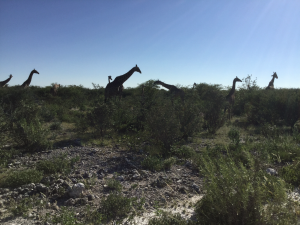 We saw herds of springbok, wildebeest, ostrich, oryx, impalas, hartebeest, honey badger and jackals. We caught a rhino about to cross the road, and if it hadn’t been for another vehicle coming by we’d have got up close and personal with him. It was amazing to be just us out there experiencing this. One day someone told us of a lion, look for the cars he said. There were only 4 vehicles, not a crowd by any means. We looked and looked for him, and then he stood up – a huge male lion. My goal in life has become seeing an elephant in the wild. 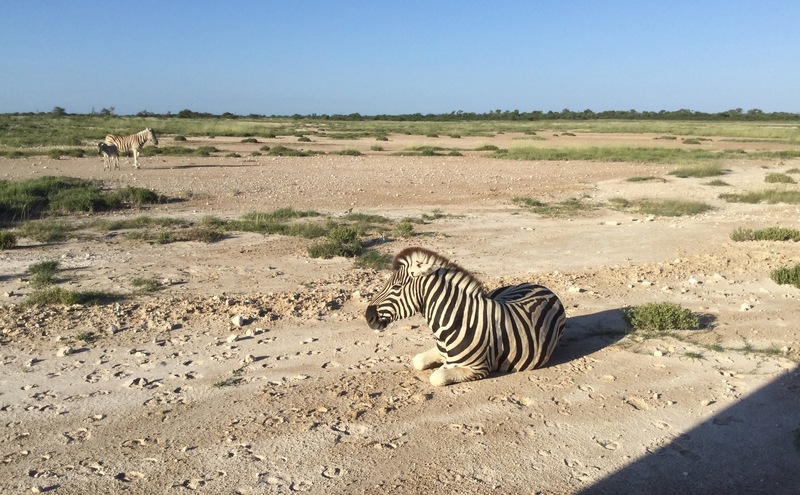 Etosha is famous for them, and this German dude showed up at the pool talking about seeing about 20 in a herd. I can’t believe they have eluded us. Our last morning in the park we go off with a purpose. They must have been just ahead of us, telling by the still steaming poop we found everywhere, but I never saw the elephants. Now we’re on our way to Botswana, camped across the river from Angola. I’m told I’ll see elephants. I just heard a hippo.